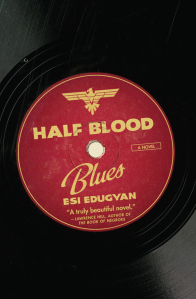 Esi Edugyan’s prize-winning novel Half-Blood Blues (Thomas Allen, 2011) tells the story of struggling African-American jazz musicians in World War II Europe. Her narrator, Sid Griffiths, is the heartsick drummer, hoping in 1992 to redeem himself from the events from 1940. Called back to commemorate a documentary about their lives in Germany, Sid asks himself to put things right, but first he re-experiences the terrible fear and painful love he felt amid Krystallnacht and the Nazi occupation of Paris. In 1940 Berlin the young jazz ensemble’s lives are unbearably taut. The competition between them holds its own agonies, yet the musicians seem as close as brothers. Never quite measuring up as a drummer, Sid doubts everything about himself, especially in comparison with his German/African friend Hieronymos Falk, a Wunderkind who has both Louis Armstrong’s attention and that of Delilah, Sid’s heart’s desire. Making it in music, making it in love–the two are equivalent for the talented, inexperienced musicians. Their music depends on each other–but so does their survival. With Germany falling to Nazism, they leave behind the inroads to success they’ve made as jazz itself has become suspect, and the musicians flee France. But Paris brings failure and betrayals and instead of safety, and still, over 50 years later, everything aches. Sid may be able to release some of his guilt and shame, but not without hurting someone he loves. Erdugyan creates these relationships and personalities using an idiosyncratic and jumpy discourse between the musicians. Their conversations and their reunion concretize–for the characters and the reader–the historical and emotional moment that has come into being when people in their 20s share remarkable experiences. Erdugyan illuminates both the historical period and the cruel bargains hearts make. Half-Blood Prince the Scotiabank Giller Prize, and was a finalist for Rogers Writers’ Trust Fiction Prize, the Governor General’s Literary Awards and the Man Booker Prize. Esi Erdugyan lives in Vancouver, Canada.